I get lots of questions, as you can imagine. 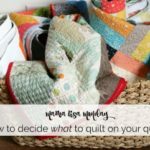 And a common question I get is, “What is the minimum I need to get started quilting?” I realize that when you start quilting, it can seem like an investment. 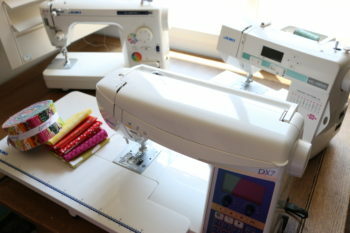 Not only the fabric, thread and batting to make the quilt, but the tools and supplies. 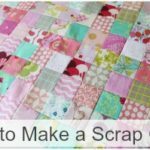 When I first started quilting, I didn’t have a lot of extra money, so I had to be VERY selective about what I could purchase because it can get expensive until you have some of the basics. The nice thing is that once you have the basics you can then add specialty things as you gain knowledge and expertise! 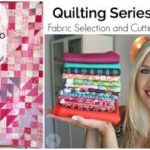 So, I wanted to share the ONE and ONLY ruler you need to get started quilting. I seriously made a dozen quilts with just this ruler… It did get a little tedious to cut small things, but it was possible. And it made me VERY thankful when I was able to purchase the Omnigrid square set that I will talk about as well. So what is this #1 ruler you should buy? … The 6 x 24! The most versatile and still my most used ruler in my quilting supplies. This ruler allows you to cut yardage very easily. When you cut yardage off the bolt, it is folded in half because most quilting cotton is 42 or 44 inches wide. This ruler is the easiest way to begin cutting that larger cut down to the sizes that you need. So, what if you already have this ruler and are ready to make your next purchase? I got you! The next ruler or actually “set” of rulers you should buy is the Omnigrid square ruler set. It doesn’t have to be Omnigrid per say if you have another brand you like better, but this is the company that sells the set which makes it much more reasonable. This set that I linked is only $20 which is great since it comes with 4 rulers. The set I originally bought from Joann Fabrics had 5 rulers, it also included the 12 1/2 x 12 1/2 size which I really like. Joann Fabrics sells a set that includes the 12.5, 9.5, 6.5 and 4.5 (no 2.5) for $45. That is a similar and great set as well, be sure to use your 40% off coupon and get that price down ;). 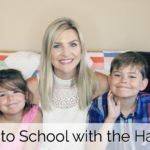 Leave a comment and let me know if this tip was helpful for you!! 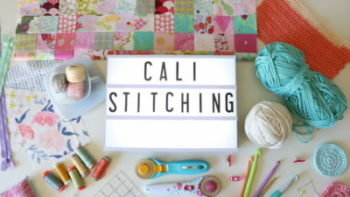 Thank you for sharing your clear and precise sewing tips.